The sponge problem of Sir W. Congreve, of rocket fame. 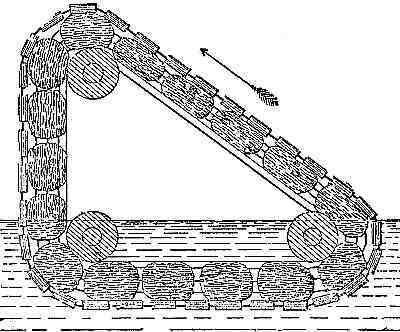 Three horizontal rollers are fixed in a frame; an endless band of sponge runs round these rollers, and carries on the outside an endless chain of weights surrounding the band of sponge and attached to it, so that they must move together, every part of this band and chain being so accurately uniform in weight that the perpendicular side will, in all positions of band and chain be in equilibrium with the hypotenuse, on the principle of the inclined plane. The frame in which these rollers are fixed is placed in a cistern of water having its lower part immersed. On the perpendicular side of the triangle, the weights hanging perpendicularly alongside the band of sponge, the band is not compressed by them; and, its pores being left open, the water, at the point where the band meets its surface, will rise to a certain height above its level, and thereby create a load, which load will not exist on the ascending side, because on this side the chain of weights compresses the band at the water's edge, and squeezes out any water that may have previously accumulated in it, so that the band rises in a dry state, the weight of the chain having been so proportioned to the breadth and thickness of the band as to be sufficient to produce this effect.